With corn prices hitting an all-time high this week, Don Close, vice-president of Rabobank’s Food and Agribusiness Research and Advisory Group says there’s ample reason for worry by confinement livestock producers. He said sourcing grain is going to be a big problem. Many livestock industry organizations have targeted the EPA’s ethanol mandate under the Renewable Fuel Standard as an unnecessary competitor for feed stocks given the serious ongoing drought all across the nation’s the grain belt. The EPA recently rebuffed calls by the organizations to waive the RFS mandate and ease pressure on grain prices. 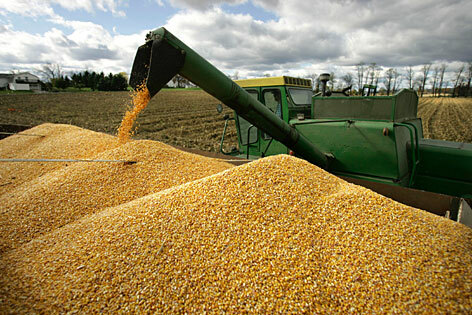 The controversy has pitted livestock producers against corn growers. Coupled with falling prices for cattle in June and early July, he said livestock producers are taking huge hits. “I think, given where total cattle inventory numbers are today, as an industry we need to look at preserving that breeding herd and have that base to recover when we do get rain. He said a second consideration for producers who need to send livestock to the feedyard is to “be looking at where that feed source is going to come from and lock in as much feed costs as is absolutely possible. Close said the number of cows and heifers available to rebuild herds decimated by the drought has reached critical lows, and we won’t see a rebound any time soon, so prudent management appears to be the most sound course of action for the foreseeable future. Click on the LISTEN BAR below to hear today's Beef Buzz. You'll find the first half of the two-part interview by clicking here. Ron Hays talks with Don Close about the effects of tight grain supplies for livestock producers.